The following PHOTO is the PROMPT. Where does your mind travel? Take us there in a hundred words or less. My story follows the prompt and the link frog. I welcome honest comments and crit. Some of you may have noticed a lack of my comments and replies last week. My editor and I have been up to our eyeballs in novel edits. I hope to catch up soon. Thank you for your patience and understanding. A heartfelt thanks to my editor and friend for sacrificing his time to help me untwist, un-hyphenate and smooth out the rough edges of the soon-to-be published PLEASE SAY KADDISH FOR ME. This night my thoughts turn toward home and you. I cherish the times we invited the moon to join us as we shared rice wine. Remember how we dreamed I would find Gold Mountain? 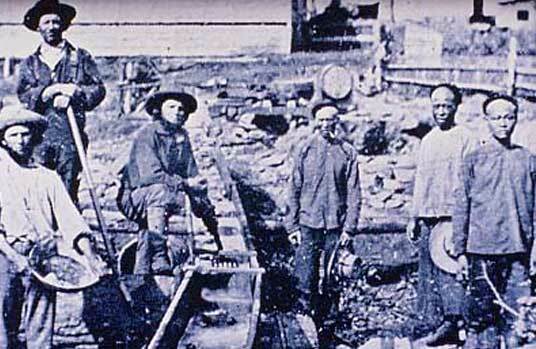 So many Chinese men came over to make their fortunes in the gold mines and found only hardship and bigotry. So sad, and so easy to imagine. A really wonderful story this week. Your comments mean a lot to me. Thank you for such a lovely one. You remind us of the exacting cost in human lives behind The Pacific Railroad Act. your tale is admirably told with restraint and compassion, leading me to reflect on the nature of ‘progress’. I’ve never figured out what makes some people think they’re superior to other human beings. Very poignant in a quiet way. The last two sentences remind us we are struggling with the same problems today. I think ignorance and bigotry are eternal. More’s the pity. Both beautiful and devastating all at the same time! Your comments make me smile. Thank you. Heartbreaking. This is not a lovely piece of history (as many regarding the :building of a nation” at the expense of others are). Alas, the birth of a nation came at a high cost to many unsung heroes who were regarded as something less than human. I like the dissonance between the beauty of the note and the bluntness and ignorance of the people who find it. Nice one. Good luck with those novel edits as well! I’m happy to be able to say that the novel edits are nearly complete. Thank you for your lovely comments. They made my day. As always, your comments mean a lot to me. Thank you for the your continued support and friendship. Me? Work too hard? Perish the thought. On the other hand, my editor is a tough taskmaster. This is a wonderful story. All these lost hopes. So sad that not even the letter made it back home. It is sad the letter didn’t make it home. No doubt there were more sad stories like this. Well written, but sad, reflection of a piece of history. You always find a story in any picture and manage to bring it to life in a unique way. Great work – Loved the disparity between the two pieces of text. The first, almost poetic – a farewell letter by a clearly educated man. The second, the ignorance of the two speakers is implied by their dialect and dismissal of writing because they don’t understand. Exactly. Orville and Levi are a couple of geniuses aren’t they? Thank you for taking the time and leave such a comprehensive comment. It means a lot. Dear Rochelle, its a touching story . You are superb in this kind of story telling. This one popped into my head as soon as I chose the photo. I love it when that happens. Thank you for your sweet comments as always. Powerful write there, Rochelle. We often forget that our train tracks to the west as well as our interstates were built on the backs of immigrant workers under deplorable conditions. Much like our service workers today, eh? We tend to be forgetful about many things like that, don’t we? Rochelle, you have weaved history and the beauty of words so perfectly to create a heart-twister….beautiful. Nice to see you hear and with such nice comments besides. Such a difficult and sad time in our history, especially as the dreams died or were modified for those thinking they would have more. The attitudes you highlighted are still present today around the world and in far too many countries and cultures. There are too many sad times in past history and the ugly history that’s being written today. Thank you for taking the time to read and comment. That means a lot. Leave it to you to find the tragedy in railroad history and tell it this poignantly. The last bit is so tragic, so characteristic of human nature. Well done. Many congratulations, yet again, on the book deal. I’m super happy for you and also understand that this can be the most difficult portion of the process as you walk through final changes. Hang in there! Your comments on my story made me smile. There’s lots of work ahead with the book deal but it’s exciting at the same time. I’m really pleased that I’ve been given the opportunity to visit my first novel with a new pair of eyes. I am sure I’m not the only FF writer to have guessed why you were absent from our blogs. Getting your book into shape quite rightly took priority. Love your story this week, too – there were probably many such letters written and only sent in spirit. Thank you for understanding. I’m not sure when or if I’ll get back to last week’s stories. I did, how ever make it through all of this week’s. I shudder to think of the unsent letters or the lives sacrificed. “We invited the moon” this is my favorite FF of all time. Such yearning in his letter. That’s high praise from a writer I’ve come to respect in a short time. Thank you for you lovely comments. Never feel the need to excuse yourself from FF for a while, and especially not when the competition involves publishing your novels. We can wait and you give us so much of your time and commitment, the only loss is by comparison to your usual high standards. (On which note, if there’s any way I can help with FF over the next few weeks, you know you need only ask). That aside, your story is once again moving and real and I really don’t know what to say that doesn’t repeat all my comments from previous weeks. Can we have a shorthand for ‘You are at the top of your game’ ? Your comments and offers to help are much appreciated. I’m not sure what you could do to help with FF. I’m thinking though. Although you certainly have your hands full at the moment. I’m pleased that you liked my story. This one came surprisingly easy. I love it when that happens since there are times I have to wrestle a flash fiction into submission. Such a beautifully written story of hopes and woes. Although I was aware of the Chinese involvement during the building of the railway, my knowledge on the topic has never been extensive, but after reading through the attachment, it has improved. So many amazing things (such as the railway) have been achieved, but more than likely at the cost of something else (in particular, the dreams of another individual). As usual, wonderfully written and my mind bank has been expanded too! I’m always happy to help expand someone’s mind bank. (love that). Rochelle, So sad to think lack of translation would keep his letter form finding its way home. She’ll never know what happened. Very sad indeed. Thank you for reading and commenting. I appreciated your time. My pleasure, Rochelle. Well-deserved ! Amazing how you humanize this dead man from the past in 100 words. Amazing! Writing these historical vignettes has made history come alive. I’m happy when it does for others, too. Excellent as always, Rochelle. A lot of our railways were built by Chinese immigrants. They are our unsung heroes. I think it’s great you bring attention this. The Chinese immigrants were indeed unsung heroes. We could’ve learned a lot from them if we’d listened. Hate is a four letter word that ignorance instils into hour mind. I remember photos like this one from our textbooks in grade-school. Your words bring new life to those images and paint a poignant story, Rochelle. Your words bring a smile to my face. Man’s inhumanity to man… This one really kicked me in the gut at the end. Your structure here is really interesting. I liked the use of the letter to reveal one side of humanity, and then the finding of it to reveal the other side. Lovely work. I appreciate your taking the time to come by to read and comment. You’ve given me something to smile about. this is a great example of a multi-layered story. It is a sad time in history, although human exploitation is not something new, unfortunately. This is a beautiful story. I loved it. There are some FF writers I respect more than others and I’d say you’re in my top ten. Your opinion means a lot to me. Thank you for your kind comments, both on my story and on the tragic history behind it. As I write this reply I’m close to finished with the edits. I’m fortunate in having a friend with a keen eye, too. I’m glad you liked this story. Thank you for your kind words. Novel edits are closing in on complete. Thank you for such nice comments on my story. From descriptively romantic through sad to the tragic ending. Just another immigrant worker dead and forgotten about. Beautifully written. Sounds like the novel is coming on, good luck with it! Thank you for your encouragement and your lovely comments on my story. Beautiful and poignant. Your speciality, and very special it is. Thank you for your lovely affirming words. 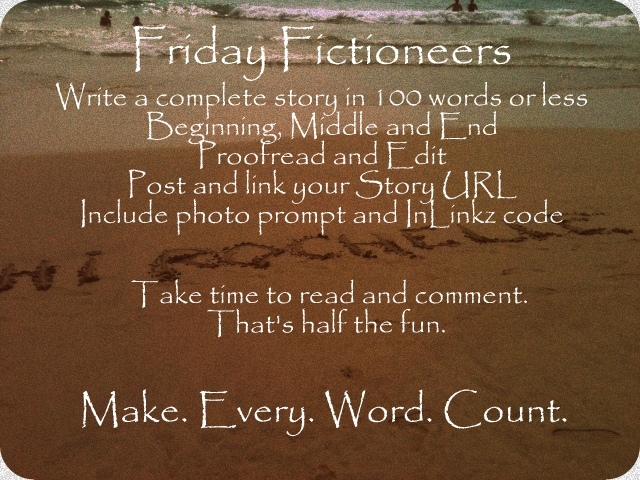 And as for your story this week…it’s brilliant. I have the best editor a person could ask for and I hope he realizes how much I appreciate his help. I’m gLad You liked my story. Brilliant is a word I never take lightly. Glad to hear it, Larry. Thank you. In 100 words, you have given a very poignant sense to a history many wouldn’t understand now. I have taught, studied, and written about the Chinese in North America. Your story says as much as a student-led 60 minute seminar, or a multi-page paper for a conference. I remember seeing a documentary about this. I think this is your best story so far. The voice of the Chinese labourer is beautiful. a tragic story that touched the heart. well done as always. Such a sad story. If only he’d at least been able to send it before he died. Sat story indeed. I wonder how many letters were really written and never sent. Never thought about the original laborer who built the first railroads. But your story perfectly captures their demise. When I chose the prompt this was the first story that popped into my head. It’s a sad piece of American history, isn’t it? I’m so pleased you took the time to read and comment. Once again, the magnitude of your talent casts a giant shadow. For me, this was a difficult prompt. I had a hard time rising to the occasion. I can only shake my head at your difficulties this week. Fantastic use of dramatic irony. Heartbreaking, and a history lesson. I’ve been overwhelmed with the comments this week, yours included. So poignant. I just love what I imagine to be some authentic voice here. In some way it puts me in mind of an accident in Morecombe Bay a few years ago when some Chinese cockle collectors working for an illegal gang-master (bastards) were trapped by the fast moving incoming tide and perished, with some speaking to their families in China as it was happening. So sad and yet so avoidable. Thank you for your incredible comment. We think we’re enlightened but I’m not so sure it’s so. I appreciate the time you took to read and comment. It means a lot. What a tragic tale — or rather two contrasting tales in one. The things people will suffer for money, swapping one type of hardship for another. As for exploitation, I see it happening in the UK today with some of our migrant workers from Eastern Europe who are willing to work in jobs that our own citizens won’t touch, in this case for minimum wages. That link you provided about the Chinese railway workers was fascinating. To think of so much blood, sweat, and tears going into building something that, latterly, thousands or millions of people have taken for granted. We have the same situation in the States with migrant workers from Mexico. I have mixed emotions on that one, but the fact is that they’re willing to do anything and everything for next to nothing to make a living. I’m pleased you checked out the link. I think my Chinese worker might have been more educated than most, according to the link but surely there were some like him. Don’t worry about the lack of comments. You’ve been busy! 🙂 Wishing you all the luck in your publishing journey! As for the story, very well done. It’s terrible how badly workers were treated when it came to the railroads, and doubly so when the overt racism is taken into account. I just clicked the ‘send’ button this morning. The novel is back in the hands of the publisher. :D, along with artwork and mug shot. Phew! I don’t know if I’ll catch up to last week’s stories or not with tomorrow being the next prompt. Glad you liked my story. I so appreciate different cultures and have always had a great admiration for Asian cultures in particular. I hate that they were treated so badly. 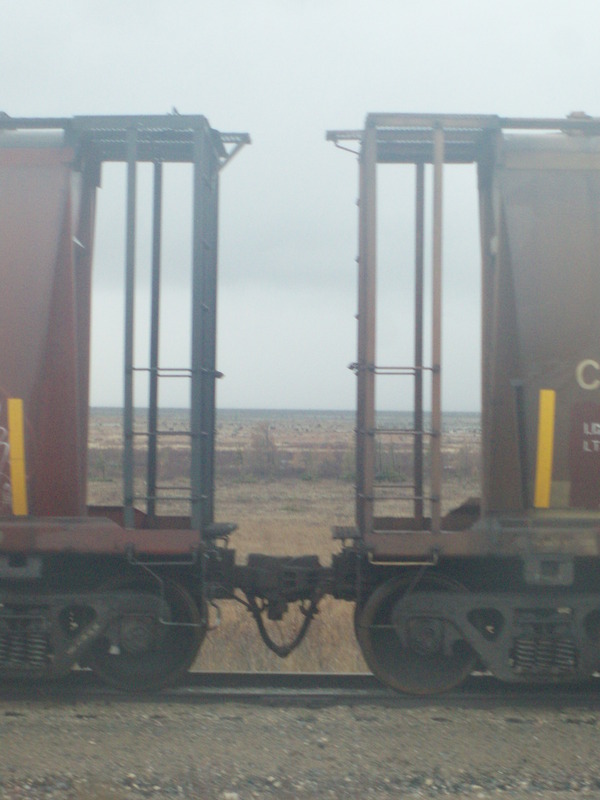 When I saw the trains, it’s where my head went, a subject that saddens and infuriates me. Thank you for your always waited for and appreciated comments. Your story reminded me of the Irish ‘navvies’ who built our railroads and canals here in the UK; a harsh unforgiving life which you show so well. Good look with the editing. The editing is done and the manuscript sent back to the publisher. So now it’s a matter waiting and working on other things pertaining to the book. Thank you for reading and leaving such nice comments. I’m spilling over into the next week trying t catch up on replies. A wonderful though tragic story. So many immigrant workers died building railroads. Their lives were so hard and extremely dangerous at times. In Britain we had the same situation with the many Irish workers (‘navvies’) on both the canals and railways. Beautifully written, Rochelle. You’re the second person who’s mentioned navvies. Sad histories. And your comment takes my breath away. We’re even. History has countless sad, if not infuriating, stories to tell, doesn’t it? Thank you for reading and commenting. You’ve been missed. The story broke my heart a little as it should have. I can’t imagine thinking any human being less than me because they weren’t white. The ignorance of man makes me crazy. Beautifully sad story and the imagery was fantastic. What is it with white people? When did that make a person superior? There’s so much to learn from other cultures, isn’t there? I’m happy to see you among us this week, my friend. I loved the letter he wrote. Wonderful imagery, evoking sadness. Humans are mostly the same. I don’t know why people can’t embrace this and that we should celebrate the differences. Beautiful story, Rochelle. I don’t understand racism. I have lovely friends of many races. They’re like a bouquet of colorful roses. The ignorance of the Orvilles and Levis of this world is tragic. Beautiful contrasting tones in your story, and wonderful imagery in the letter. Powerful. For some reason, this was one of the easiest and most immediate stories I’ve written. I’m glad it worked. I love historical flash….. You nailed it with this one! Such a stark contrast between the two worlds in the story. Thank you, Subroto. I love the Chinese character. Nice touch. You’ve written a sorrowful story. I have a friend who has told me many stories about the days of the building of the Panama Canal. Those who came before us and the way they suffered for a better life should be revered. Your story is powerful in that way. There are too many roads built on the backs of others. Gracias for your lovely comment. Beautiful. We are all ignorant in our own way. You told this with just enough clues and the right amount of filling in the blanks. Here it is Wednesday and I’m still catching up with last week. Ignorance isn’t necessarily bliss is it? When one doesn’t know enough to understand, one should reserve judgment. Words of wisdom that were certainly beyond the grasp of such men as Orville and Levi. A brilliant summation of an attitude that is sadly widespread – it is not my culture so it has no value. Thank you for such a lovely comment. You’ve made me smile, kind sir.